Darker skin tones from Mediterranean to African skin type are affected differently from eye bag removal surgery. While darker skin tends to have the advantages of being thicker and less prone to sun damage due to high melanin content when compared to lighter skin types, darker skin is also more prone to scarring when incisions are made. Darker African skin is more prone to keloid scar formation than Caucasian skin. Keloid scarring refers to slightly elevated scars, widened scars, or hyperpigmented scars where incision areas darken skin even further. 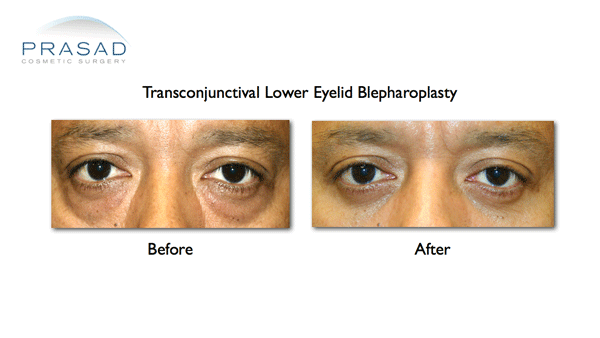 The transconjunctival approach to lower eyelid blepharoplasty requires no external incision which is highly prone to keloid scarring in darker skin types. This ethnic anatomic difference rules out general plastic surgeons in performing eye bag removal surgery in people of African descent. General plastic surgeons and other cosmetic surgeons who don’t specialize in eyelid surgery are trained in the transcutaneous technique of eye bag removal surgery (lower blepharoplasty), which makes an incision just below the eyelashes to remove and reshape the fat that causes eye bags. Transcutaneous blepharoplasty, the most commonly practiced eye bag surgery, is not advised for people with darker skin because of the risk of scarring. The best eye bag surgery approach for all skin types, and most notably for darker skin is a transconjunctival blepharoplasty. The transconjunctival approach leaves no external incision, so there there is no possibility of a scar. The transconjunctival approach is done from the inside of the eyelid, where fat is excised and sculpted to eliminate the constantly present eye bags. The transconjunctival approach works well on all skin types, and is also effective in older patients, without the removal of eyelid skin. Transconjunctival blepharoplasty has to be asked for by name, or referred to as eye bag removal with no external incision. 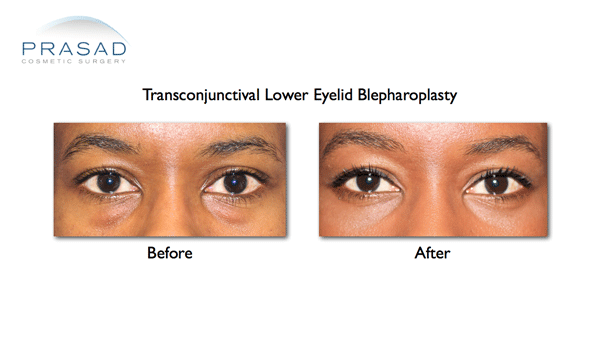 The transconjunctival technique is practiced by specialty eyelid surgeons such as oculoplastic/ oculofacial plastic surgeons like Dr. Prasad who undergo specialty fellowship training for the eyes, eyelids, and orbit. Other cosmetic and plastic surgeons who choose to focus on the eyelid surgery may also use the transconjunctival approach, but they must be asked directly if they use the technique. Board-certification and testing of general plastic surgeons, and cosmetic surgeons only requires knowledge of the transcutaneous method, where the fat that causes the eyelids is removed and sculpted from an incision below the eyelashes. Other than the cosmetic benefits of not having any visible scars, and preventing the formation of keloid scars, the transconjunctival approach also preserves the delicate anatomic support structures of the lower eyelid. This prevents the lower eyelids from losing vertical support, which can happen when the transcutaneous method is used. Losing vertical support of the lower eyelids during eye bag removal surgery can lead to the lower eyelids being pulled down (lower eyelid retraction), or the lower eyelids being pulled down and outward causing irritation (ectropion). Transcutaneous blepharoplasty where an incision below the eyelashes to remove eye bags may, or unnecessarily removing eyelid skin can lead to eyelids being pulled down (lower eyelid retraction). 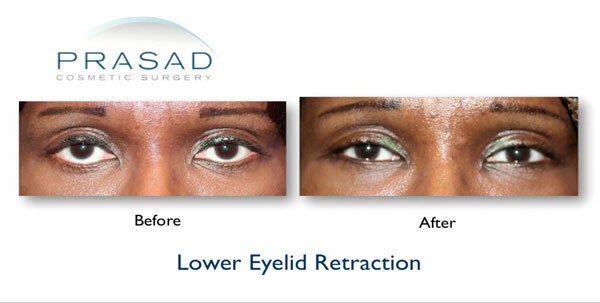 Reconstruction by an oculofacial plastic or oculoplastic surgeon like Dr. Prasad is needed to restore the eye shape. Ectropion and lower eyelid retraction can be repaired by through specialized reconstructive surgeries performed by oculofacial/oculoplastic surgeons, but these are extensive and costly procedures. In the end, having eye bag surgery done by an eyelid specialist through the transconjunctival approach avoids the excess time and cost of revising a cheaper surgery done by a general plastic surgeon or general surgeon. If puffiness under the eyes is bothering you, contact us today for expert advice and treatment at (212) 265-8877 in Manhattan, or (516) 742-4636 in Garden City, Long Island, or fill out the contact form below so we can get back to you.